Start VueMinder using the desktop shortcut or Start menu. The Calendar View occupies the majority of VueMinder's main window. 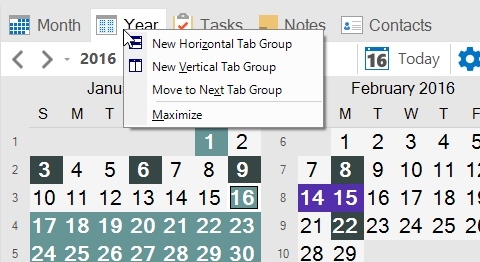 Double-click the task tray icon, or right-click and select the "View Calendar" command. 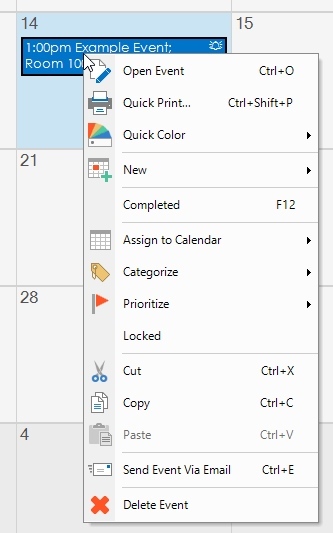 Click the "Show Calendar" button in the upper-left corner of the full-mode Desktop Calendar. 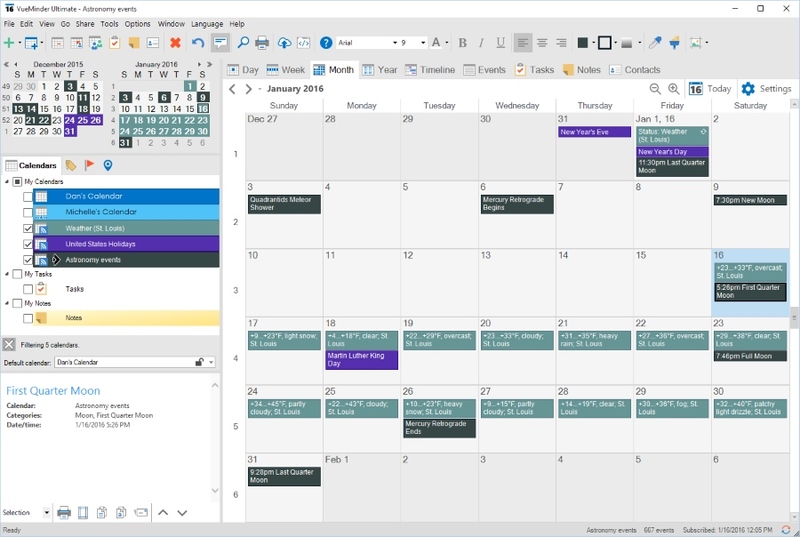 The calendar view is where your events, tasks, notes, and other data is shown. It consists of a number of view types, each on a tab that can be dragged to an edge of the view to customize the layout or show multiple views simultaneously. These view types each have a unique intent, enabling you to select the view type most appropriate to the way you'd prefer to visualize your data. Day View - This view shows an day, divided into timeslots from top to bottom. Multiple days can be displayed side-by-side, so this view can be used as an entire week view, if you prefer this layout to the layout provided by the Week view. Up to 14 days can be viewed within the Day view. Week View - This view shows a week. It enables switching between two layout styles - a 3x2 grid and a side-by-side day column layout. Month View - This view can be used to show an entire month, or between 1 and 16 weeks. Each week is a row, divided into days. The first day of the week is controlled via a Calendar Option. Year View - This view shows an entire year. Dates with events are color-coded. Hovering the mouse over a date will show a summary of that date's activities. Timeline View - This view shows a horizontal representation of your schedule. Timeslots are arranged from left to right, and can be scaled to be between 15 minutes and 4 weeks. Events List - This view shows a listing of events. The list provides many capabilities, such as row filtering, grouping, sorting, and more. This is also where event search results will be shown. Tasks List - This view shows a listing of tasks, similar to the Events List. Notes List - This view shows a listing of notes, similar to the Events List. Contacts List - This view shows a listing of contacts. The list can show all contacts or only contacts whose name begins with a specified letter. The list can also be searched, sorted, filtered, exported, and more. The Day, Week, Month, Year, and Timeline Views will include several buttons in the upper-right corner. Zoom Out - This will zoom out the calendar view, making more dates or time slots visible, but decreasing the amount of space available for individual events/tasks/notes. Zoom In - This will zoom in the calendar view, making fewer dates or time slots visible, but increating the amount of space available for individual events/tasks/notes. Today - Clicking this button will make today's date visible, scrolling the calendar view as needed. Settings - This will show the Settings menu for the current view type. This is a very important button for getting the most out of VueMinder. Each view type can be selected and displayed by clicking its tab, or by selecting the view from the Go menu. For example, in the following screenshot, the Month view is active. To make a different view active, such as the Day view, its tab name would need to be clicked. By default, each view will occupy the entire Calendar View area. Several alternative window layouts are provided where views are shown simultaneously, such as having all the List views (Events, Tasks, Notes, Contacts) at the bottom of the window and the Day view along the right edge. These window layouts can be loaded from the "Window Layout Presents" command on the Window menu. You can also define your own custom window layouts by dragging the view tab names to a desired area and edge. Any number of areas within the Calendar View can be defined, and one or more tabs dragged into it. 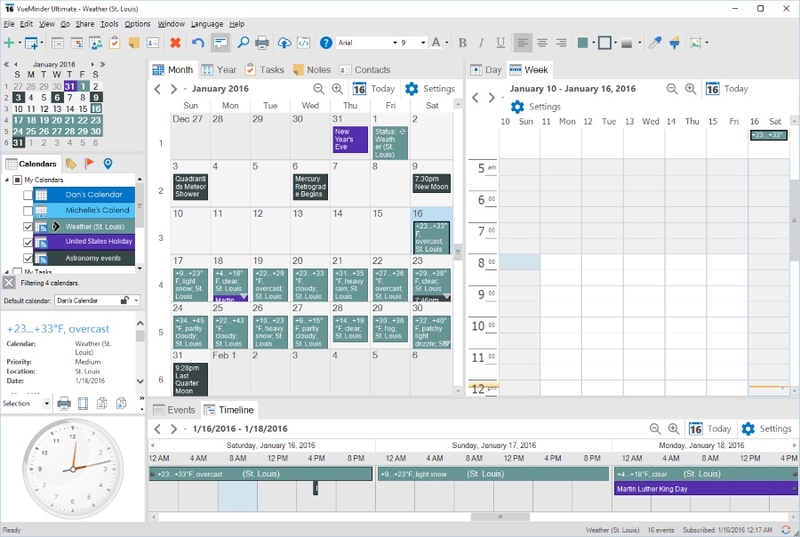 A couple example layouts are shown below, to demonstrate the flexibility of the Calendar View. In this example, the Day tab was dragged to the right edge, and the List tab to the bottom edge. In this example, the Week view was dragged into the Day view area on the right edge, and the Timeline View dragged to the List view area on the bottom edge. Display of an analog clock was also enabled using the View menu. In addition to dragging the tabs, they can also be right-clicked, and an option selected from the popup menu to control the positioning of the selected view. Left/right navigation arrows and the currently displayed date range will be shown the top of the Day, Week, Month, Year, and Timeline views. You can navigate to previous or next dates by clicking the left or right arrow buttons, by clicking the drop-down arrow to the left of the date label and selecting an entry, or by pressing Ctrl+LeftArrow or Ctrl+RightArrow on the keyboard. 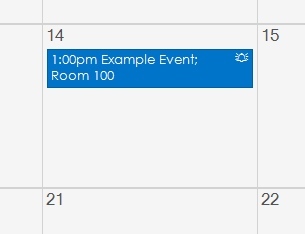 You can create a new event by double clicking an empty space in the desired date or time slot. A normal, non-recurring, event will be created. 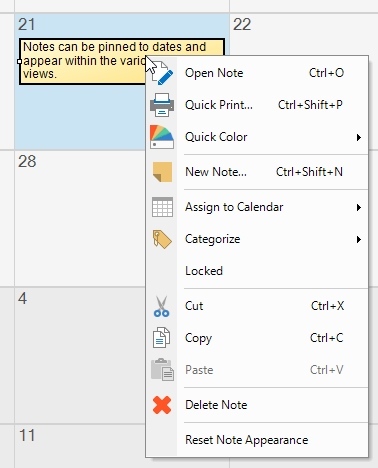 If a note or task calendar is active in the Calendar List, double-clicking an empty space in the Calendar View will create a new note or task, respectively. You can use the "New Event" command from the Main Toolbar or the File Menu, or use the Ctrl+N keyboard shortcut. You can create new events by right-clicking and selecting the "New Event", "New Recurring Event", or "New All Day", or "New Meeting Request" commands from the context menu. The Event Editor will be displayed for the new event. Other data types, such as tasks and notes, can also be created from the toolbar or menu commands. You can open an item by double-clicking it. If double-clicking an event, it will open in the Event Editor. If a recurring event is selected, you will be prompted to select whether you want to open the selected occurrence or the entire series. You can skip this question and open just the occurrence by holding the Alt key while double-clicking the event. If double-clicking a task, it will open in the Task Editor. If double-clicking a note, it will open in the Note Editor. If double-clicking a contact, the contact will open in the Contact Editor. If double-clicking a distribution list, it will open in the Distribution List Editor. You can also open an item by single-clicking it and then pressing Enter or the Ctrl+O keyboard shortcut, or by right-clicking it and selecting the Open command. Events, tasks, and notes can be moved to different dates or timeslots by dragging. Click the item and hold the mouse button down. Then, move the mouse to drag the item to the desired date and/or time slot. Release the mouse button to complete moving the item. The duration of an event or task can be changed by resizing its box. The box corresponds to the starting and ending date and time of the event or task. Depending on the active view, these dates or times can be modified by resizing the event or task box. All-day events can have their left and right edges resized to adjust their starting and ending dates. Non all-day events and tasks that have a start time can have their top and bottom edges resized to adjust their starting and ending times. Events will be colored in 4 different ways, depending on the "Color Events Using" selection on the View menu. 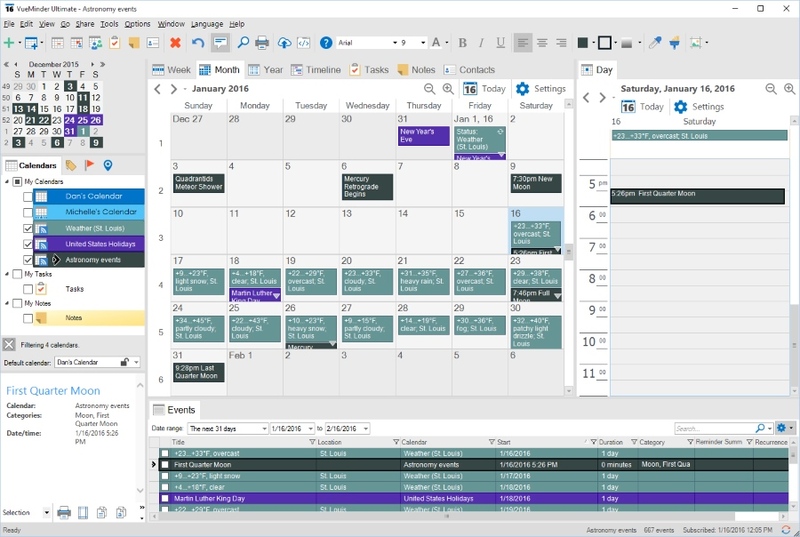 For example, if events are colored based on the current tab in the Calendar Items area, and the Calendar Items tab is set to Calendars, then events will be drawn based on the appearance settings of their associated calendar, as specified on the Appearance Toolbar or Calendar Properties. Events can also be colored based on associated category, priority, or location. All calendar views will color events the same, for consistency. In addition to the primary event color, a secondary color can also be shown in a "sidebar" of the event. This enables two colors to be shown at the same time. For example, events could be colored based on associated category with a sidebar showing associated priority. High priority events default to red, medium to orange, and low to yellow. The sidebar color mode can be selected via the "Color Event Sidebar Using" command on the View menu. The sidebar is hidden by default. 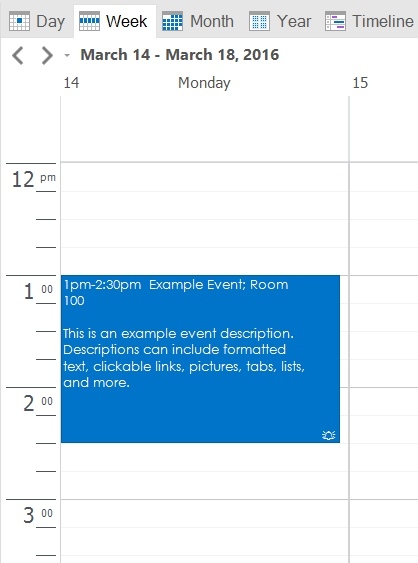 Depending on the current view type, window size, and event font size, the information displayed in event blocks will vary slightly. For example, on the Month View, the event starting time, ending time, and location might be shown, depending on the level of detail selected from the Month View Settings sub-menu of the Go menu. The event text might also word-wrap, if it won't fit on one line. If you cursor over an event, a tooltip will be displayed showing additional information. In the Day and Week Views, event blocks are located within their associated time slot(s). Event times and descriptions can also be displayed, if there's enough space available and the assoicated options in the Day and Week View Settings sub-menu of the Go menu are enabled. An event with an associated reminder will display with an alarm bell icon. The reminder could be a popup reminder, desktop alert, email reminder, text message reminder, or any combination of those. When the reminder has been processed or dismissed, the icon will be removed. A recurring event will display with a recurrence icon. A variation of a recurring event will display with a recurrence icon that is crossed out. For example, if a recurring event normally starts at 10:00 AM, and you need to modify an instance of the event to occur at 11:00 AM, the variation icon will display to indicate the event is normally recurring but has been changed. Tasks do not provide the same appearance settings as events. Instead, they will be colored based on status. By default, overdue tasks will display with bold red text. Incomplete tasks that are not overdue will have a gray border and plain black text. Completed tasks will have crossed-out gray text. The task colors can be modified via the Task Calendar Properties window. Notes can be pinned to dates and appear within the various calendar views. Note appearances will default to the associated note calendar appearance, which can be specified in the Note Calendar Properties window. Appearances of individual notes can also be customized on the Appearance tab of the Note Editor. Notes that aren't pinned to dates will only appear in the Notes view. To see the full text of a note, hover the cursor over the note or double-click it. Long notes might not show all their text in the Month view. 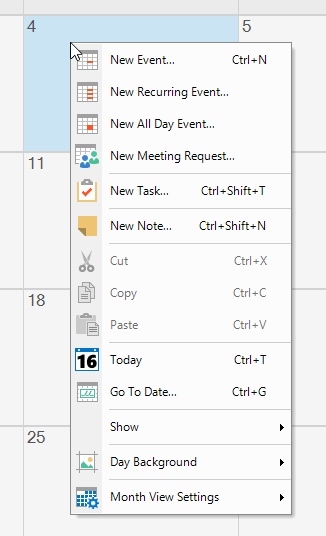 Right-clicking an empty area within the calendar view, where there is no event, task, or note, will result in the following context menu appearing. Some options might vary slightly depending on the active view type. This command will display the Event Editor, where a new event can be defined. The event will default to being at a certain time of day and non-recurring. These settings can be modified from within the Event Editor. The keyboard shortcut is Ctrl+N. This command will display the Event Editor, where a new recurring event can be defined. The event will default to being at a certain time of day and recur weekly on the selected day. These settings can be modified from within the Event Editor. This command will display the Event Editor, where a new all-day event can be defined. The event will default to being all day and non-recurring. These settings can be modified from within the Event Editor. This command will display the Event Editor, where a new meeting request can be defined. Meeting attendees can be added on the Meeting tab of the Event Editor. The meeting request will be sent to the specified attendees via email. This command will display the Task Editor, where a new task can be defined. The task will default to being on the day that is active or was clicked. The keyboard shortcut is Ctrl+Shift+T. The command will display the Note Editor, where a new note can be written. The note will default to being pinned to the day that is active or was clicked. The keyboard shortcut is Ctrl+Shift+N. This will cut the event, note, or task that is currently selected. The item will be removed from the calendar and placed on the clipboard. This menu option is enabled only when one or more events, notes, or tasks are selected. To select multiple items, hold the Ctrl key while clicking. This will copy the event, note, or task that is currently selected. The item will be copied to the clipboard. This will paste the event, note, or task that was previously cut or copied, into the currently selected date or time slot. The date of the original item is not preserved, but its time of day and duration are. This enables an item to be easily copied and pasted to multiple dates. If there is not an event, note, or task on the clipboard, this menu option will be disabled. Clicking the Today menu option will cause today's date to be selected and displayed. It will also make the current timeslot visible in the Day and Week views. The keyboard shortcut is Ctrl+G. This toggles whether tasks will appear in the Calendar View. The default setting is to include tasks in the Calendar View, but if you prefer to only see these in the Tasks view, you can uncheck this option. This toggles whether notes will appear in the Calendar View. The default setting is to include notes in the Calendar View, but if you prefer to only see these in the Notes view, you can uncheck this option. This toggles whether completed events will appear in the Calendar View. When unchecked, completed events will be shown as faded, to indicate they have been completed. This toggles whether completed tasks will appear in the Calendar View. 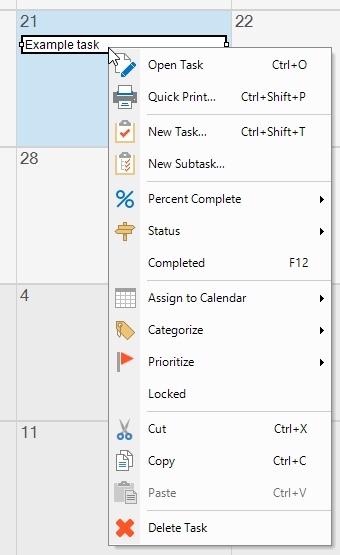 When unchecked, completed tasks will be shown with gray crossed-out text (unless otherwise modified via the Task Calendar Properties window), to indicate they have been completed. This expands into a submenu providing commands for setting a background color or image on the selected date(s) in the Month view. A command is also provided for clearing any existing backgrounds. These commands are also available on the Edit menu. For more information, see the Day Background documentation. Depending on the view type, a View Settings submenu may be displayed. This submenu contains menu options for adjusting the view's settings, such as the number of visible weeks or the timeslot interval. For more information, see the documentation for the Day View, Week View, Month View, Year View, Timeline View, or List View. Right-clicking an event will result in the following context menu. This command will print the details of the selected event, as shown in the Details pane. The keyboard shortcut is Ctrl+Shift+P. The Quick Color command can be used to quickly override the default event color. A limited selection of pre-defined colors are available in the Quick Color command. If you want a different color, you can use the Appearance Toolbar or the Appearance tab on the Event Editor. Events can be marked as completed by using the Completed context menu option. After marking an event as completed, it will either be hidden or faded, depending on the View menu option for showing hidden events. The keyboard shortcut is F12. 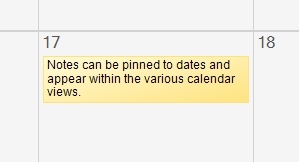 To assign the event to a different calendar, click the desired calendar from the list. The menu expands into a listing of your writable calendars. An event can be assigned to a different calendar. When assigning an event to a task or note calendar, the event will be converted into a task or note, respectively. This menu command won't appear for events that belong to a recurring series, are locked, or associated with read-only calendars. This menu option toggles whether the selected event is locked. Events can be locked to prevent accidental modification or deletion. This command will only work if you have an email program (such as Microsoft Outlook) installed on your computer. Multiple events can be sent at the same time by Control-clicking the events you'd like to email. The keyboard shortcut is Ctrl+E. If you accidentally delete an event, the Edit menu's Undo command can be used to restore the event. Locked or read-only events can't be deleted. Right-clicking a task will result in the following context menu. After selecting this command, the select task will open in the Task Editor, enabling its properties to be viewed or modified. This command will print the details of the selected task, as shown in the Details pane. This command will create a new subtask for the selected task and display it in the Task Editor where the subtask can be further defined. Tasks can be marked as completed by using the Completed context menu option. After marking a task as completed, it will either be hidden or crossed out, depending on the View menu option for showing hidden tasks. When a task is marked completed using this menu command, the percent completion will be moved to 100% and the status will be set to Completed. The keyboard shortcut is F11. This menu command enables the selected task to be quickly re-assigned to a different calendar. The menu expands into a listing of your writeable calendars. To assign the task to a different calendar, click the desired calendar from the list. A task can be assigned to a different calendar. When assigning a task to an event or note calendar, the task will be converted into an event or note, respectively. This menu command won't appear for tasks that are locked or associated with read-only calendars. This menu option toggles whether the selected task is locked. Tasks can be locked to prevent accidental modification or deletion. Locked or read-only tasks can't be deleted. Right-clicking a note will result in the following context menu. After selecting this command, the select note will open in the Note Editor, enabling its text to be viewed or modified. This command will print the details of the selected note, as shown in the Details pane. The Quick Color command can be used to quickly override the default note color. A limited selection of pre-defined colors are available in the Quick Color command. If you want a different color, you can use the Appearance Toolbar or the Appearance tab on the Note Editor. This command will display the Note Editor, where a new note can be written. This menu command enables the selected note to be quickly re-assigned to a different calendar. Selecting a category from this menu will re-associate the note(s) with the selected category. If the note had multiple category associations previously, those will all be removed and replaced with the single selected category. Note categories can also be assigned via the Note Editor. This menu option toggles whether the selected note is locked. Notes can be locked to prevent accidental modification or deletion. Locked or read-only notes can't be deleted.